I wonder if there is some top secret laboratory at 7-Eleven Corporate HQ where an elite team of stoners works late nights to come up with new and improved snack technology. Ever since McDonald's managed to improve on the Egg McMuffin (which revolutionized the breakfast sandwich) by creating a pure American version -- the McGriddle, which eschews the McMuffin's Canadian bacon and English muffin in favor of real American bacon and quintessentially American pancakes -- I have eagerly awaited a new challenger. From this photo, I can't tell if this thing has cheese in it ... I sure hope so. 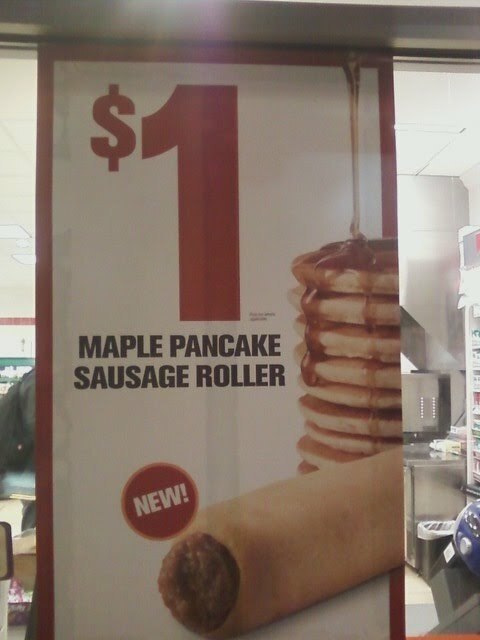 I have to assume the maple flavor is built into that pancake wrapper, but maybe the idea is that you dunk it into a cup of syrup. It's got the right shape for dunking. Anyway I'd like to see someone who really understands the subtle science of breakfast sandwiches do a straight-up bite-for-bite, side-by-side taste comparison between the McGriddle and this latest effort from 7-11. Perhaps A2GastroBoy could be coaxed into making the sacrifice. I thought the maple syrup would be served as a chaser.